For years, carmakers have tried and failed to create a BMW 3 Series fighter that’s better than the 3 Series. So BMW went ahead and built one themselves. The 4 Series Gran Coupe is a quad-doored variant of the two-door 4er Coupe, itself based on the 3 Series sedan. Think of it as a 3 Series with style. And lots of it. Especially the quasi-sporty M Sport derivative we tested for a week, which adds a muscular bodykit, a firmer suspension setup and 19-inch rims. 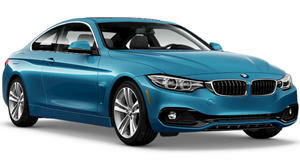 Despite the four-door coupe already coming with a full leather interior, parking sensors, and 6.5-inch color screen as standard, the M Sport trim is worth the extra cash. The Gran Coupe comes with a choice of engines, but we were supplied with the 420d diesel – a 2.0-liter 181-hp four-pot – along with the recently rolled out xDrive four-wheel-drive. Brisk getaways are combined with plenty of grip, and when the roads are suddenly coated in an all-too-frequent British rain shower, a car driving all its wheels ensures no compromise on balance and stability, not to mention peace of mind. You’ll struggle to be a hooligan in this, but with the adaptive dampers set to Comfort and that butter-smooth eight-speed automatic, the flipside is a consummate cruiser. And with the diesel powerplant delivering ample levels of torque, there’s more than enough poke underfoot to help you glide past highway slackers. We had the chance to test it against the 3 Series 320i with a manual. That’s the car you want if having absolute control over the car and being able to throw out the back end is your thing, despite the manual being a bit stiff. Lugging a couple of kids and a trunkful of gear around, the 420d XDrive’s practicality was put to the test, something it passed with flying colors. Thanks to the tailgate hatch and two rear doors, accessing the 435-liter boot and rear passenger space was a doddle. Marginally tighter than the 3 Series, rear headroom is fine unless you’re well over six foot, and there’s plenty of leg space too. Compared to its most logical rival, the Audi A5 Sportback, there’s more interior space, not to mention the fact it’s better to drive. Going back to the 3 Series, in terms of the thrill of the drive, body control and dynamism the cars are identical, but when it comes to looks, there’s a standout winner. It’s less ubiquitous than the 3er and certainly more glamorous. In short, the 4 Series Gran Coupe draws attention that a 3 Series never could. It’s more money, but for that you get plenty of style without compromise.